Strict self-discipline is a natural and traditional merit of our Army. It is also the foundation of our military might. To preserve this value, every military member must uphold a discipline and law abiding spirit to build a revolutionary, standardized, elite, and gradually modernized defense force capable of accomplishing every mission. President Ho Chi Minh once said: “A strong army is the fruit of adept education, correct policy and firm discipline.” Therefore in recent years, under the leadership of Central Military Commission and Ministry of National Defense, legal education and propaganda activities have been an emphasis in the army. As a result, discipline and the rule of law have been gradually improved, enabling units to comprehensively strengthen their capabilities and combat readiness. With the counseling of Legal Education Coordination Council (LECC), the Minister of National Defense had enacted several periodic and annual legal education plans. Subsequently, military commands and party committees at all levels executed these plans in an earnest manner with adjustments appropriate for the functions of their units. Also, LECCs at respective levels were reorganized for better quality, more sufficient quantity and more effective structure. These bodies constructively provided counseling for units’ leadership to successfully implement legal education projects; and closely inspected and monitored the state of discipline and order in their units. In addition, legal education plans were conducted with functional, practical, creative and diverse activities, which managed to attract a large number of military members and civilians to participate in. So far, there have been many legal education programs which proved to be very intriguing and effective such as: “Legal and mentality counseling group for military members”; “One legal topic a day,” “Learn your weekly legal article”; “Legal study club for soldiers”; “Legal education and propaganda group”; “Legal education day” dramatization; and legal awareness contests; etc. Also, legal document archiving in military units was significantly improved in both quality and quantity. Mobile court-martials were conducted strictly in compliance to the rule of law and in a timely fashion. As a result, military members had greater access to legal information and knowledge, their discipline and law abiding consciousness was considerably enhanced, and the number of discipline and legal violations and civil offense incidents in the military has been generally reduced. However, at times there were discipline and law violations still occurred in some military units with complex developments and consequences. The primary cause of these incidents was the lack of attention of units’ leadership in educating and enforcing discipline and rule of law for their soldiers. In some units, personnel, weaponry, equipment and barrack management was not properly conducted and the work of inspecting and monitoring the implementation of military discipline and legislation was not carried out on a regular basis. Especially, some commanders did not strictly exercise discipline and even ignored or clouded violation incidents of their subordinates. Presently, the global and regional political and security environment is facing emerging threats. Also, in Vietnam, adversary forces are pushing forward their strategy of “peaceful evolution”, which may lead to “self-transformation” and “self-evolution” in our government as well as our armed forces, causing a lot of challenges to the progress of complementing and enforcing our legal system. Social evils and violence sometimes had negative impacts on soldiers’ mentality and consciousness. Therefore, the work of enhancing discipline and rule of law awareness to commensurate with requirements for military building progress has become an imperative task. There are several measures must be taken to accomplish this task. First, improve military members’ discipline and law abiding consciousness. A good soldier always has adequate knowledge and understanding of the legal system, puts his trust in it, strictly abides the law and imposes self-discipline. To forge such soldiers, military leadership and party committees at all levels must promote legal and political education activities, especially programs that provide education on Party’s guidelines, legal knowledge and military discipline. In doing so, soldiers’ perception and conduct will be improved. Their working and living style will be developed into a disciplined, organized and standardized manner. This work should be implemented regularly with detailed, practical and appropriate plans for specific groups of military members. Also, those plans need to include contents about legal documents on military issues, national defense policies and other types of legal paper published by Ministry of National Defense. In executing these legal education activities, units’ leadership and responsible personnel should apply necessary adjustments to make them correspondent with units’ function, operational environment and state of affairs and become more appealing and persuasive for their men to participate in. Most importantly, this work must be recognized as a crucial and regular task of military units; at the same time, it must aim for dealing with the perception in which the work of legal education is taken lightly and this responsibility only falls on units’ leadership, party committees and LECCs. Second, uphold the role of LECCs, and their related personnel. This is a fundamental element in comprehensively and steadily improving the discipline and rule of law consciousness of military members. Therefore, LECCs at all levels should be strengthened in both quality and quantity and structure as well; in addition, these bodies should focus on complementing their operational mechanism and increasingly monitoring and involving in legal education activities. Also, they should actively provide assistance to units’ commanding staffs and party committees in organizing monthly “Legal Study Day” and annual “National Legal Education Day” (November 9), ensuring these events were held with creative and diverse programs and appropriate to unique characteristics of military environment. Besides, LECCs should closely cooperate with political and legal divisions on implementing legal education programs and evaluating the quality of these activities to identify limitations, address downsides and improve their outcomes. At the same time, these councils should conduct assessments on the performance of legal education personnel as well as standardize the function of those individuals, these activities will serve as a basis for advancing training and enhancing their role in military units. Due to the fact that most legal education jobs are secondary roles of related military members, training activities for these cadres should be implemented under an appropriate timetable, and provide both legal knowledge and teaching methodology. Most importantly, legal education personnel must be good examples in self-discipline, living style, working performance and daily conduct. Third, increasingly implement measures for managing soldiers’ mentality to maintain discipline and rule of law and promote standardized conducts in units at junior level. In advancing law and order consciousness of military members, mentality management and political education are extremely crucial factors. In addition, commanding officers at all levels must be aware of their men’s personal background and social relationships, especially at sensitive areas of operation to prevent any negative development in their thoughts and conducts, and actions that may have pessimistic impacts on their units. Grasping and strictly following Minister of National Defense’s Guideline 04/CT-BQP issued on February 9, 2012 with the theme “Enhance discipline education and enforcement to prevent severe violations in Vietnam People’s Army,” military units must increase their political and legal education activities in conjunction with resolute measures to maintain discipline and daily and weekly inspections; also, they must assertively prevent discipline and law violations among their men. Units’ leadership is responsible for building standardization manner and imposing discipline for their subordinates, so they must also be exemplary in these aspects. In fact, when heads of units show exemplarity in discipline and law abiding consciousness and working and living conducts, their soldiers often voluntarily follow those examples. On the contrary, if unit commanders take discipline and rule of law lightly, their men are prone to frauds and violations. So that military commanders must constantly impose self-discipline, demonstrate exemplarity in working and living manners, and uphold their responsibility to promote the work of legal education in their units. Besides, they must pay attention to their men’s living condition and mentality and build a favorable environment for them to follow discipline and abide to the rule of law. Fourth, continue to study and strictly abide the Constitution, legislatives and legal education programs. Taking the 2013 Constitution as the basis, Ministry of National Defense’s Legal Affair Division must continue to conduct research, propose amendments and publish legal papers related to military and national defense issues to enforce in VPA units. Besides, National Legal Education Program 2017-2021 must be fully grasped and successfully implemented in Ministry of National Defense. 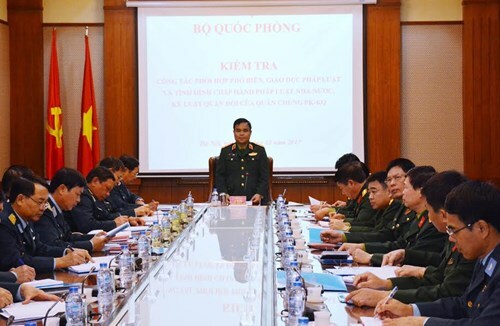 In doing so, commanding officers and heads of divisions must seek for innovative and advanced measures to improve the quality of legal education activities and integrate them into the accomplishment of 12th Politburo’s Directive 05-CT/TW “Further study and follow Ho Chi Minh’s ideology, moral example and living style,” and “Uphold tradition, devote talents, be worthy of the title Uncle Ho’s soldier” movement. In these tasks, increasing understanding and developing consciousness of self-discipline are crucial and decisive elements. In reality, there is a gap between understanding the law and actually following it, so that the work of providing relevant legal knowledge for military members does not only include informing them about legislative contents; most importantly, legal education activities should make them understand the necessity of abiding the law and be aware of the consequences of illegal actions. Besides, the contents selected for legal education programs should be practical and tailored to be appropriate to specific groups of soldier’s function, duty and other characteristics. Also, they should be compact, to-the-point, easy for soldiers to understand and memorize and focus on educating military discipline, the rule of law, the responsibility of preserving and protecting public properties and providing information about legal penalties for specific violations. Fifth, increasingly conduct inspection and impose strict and fair penalties on violation incidents. Commanding staffs and party committees at all levels must fully grasp and closely follow Ministry of National Defense’s annual plan of monitoring the state of law enforcement in the military and integrate inspection activities into the work of monitoring internal security. In case a violation incident occurs, the unit leadership must strictly follow Ministry of National Defense’s Circular 192/2016/TT-BQP released on December 26, 2016 on “Instruction for applying disciplined penalties, procedures, due process, duration of validity and authority in processing discipline in the military”. The procedure of imposing discipline must be implemented strictly by the rule and in a timely fashion and the final penalty must serve as a lesson not only for the violator but also for the entire unit. At the same time, military units should actively coordinate with local authorities to prevent and fight against social evils and other likely cause of violation incidents, hold regular joint-briefing with local authorities on current social situation around their base and relationship between the unit’s members and local civilians. In conclusion, as the task of building the military and enhancing national defense has become more and more demanding, discipline and rule of law consciousness in the military has also become increasingly important. So that, military units must fully grasp and closely follow the five measures mentioned above in order to build a disciplined and standardized army, enhance our military capabilities and combat readiness, and fulfill any duty.